kandeej.com: Trash or Trend: would you wear a romper or jumpsuit? 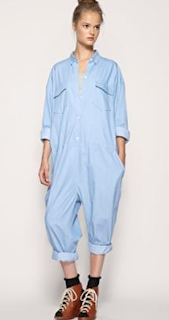 Trash or Trend: would you wear a romper or jumpsuit? and a slight chance of denim jumpsuits! Aside from the difficulty when it comes time to run to the ladies room...what do you think? Would you romp around in a romper or jump straight into a jumper? What would Rosie the Riveter think? Would you romp the Romper? Sign me up...I'm ready to Romp! Just say no to the Jumper! Not sure if I could pull this off. Looks like too much work if you have to use the bathroom! Kandee! I need your help. I'm sure when u get this I will be home, but I am on vacation in Florida and thought it would be a good idea for you to do a tutorial on how to do make up and hair in humid weather. Especially with it being summer and all :) love you lots!